For black women in antebellum Charleston, freedom was not a static legal category but a fragile and contingent experience. In this deeply researched social history, Amrita Chakrabarti Myers analyzes the ways in which black women in Charleston acquired, defined, and defended their own vision of freedom. Drawing on legislative and judicial materials, probate data, tax lists, church records, family papers, and more, Myers creates detailed portraits of individual women while exploring how black female Charlestonians sought to create a fuller freedom by improving their financial, social, and legal standing. Examining both those who were officially manumitted and those who lived as free persons but lacked official documentation, Myers reveals that free black women filed lawsuits and petitions, acquired property (including slaves), entered into contracts, paid taxes, earned wages, attended schools, and formed familial alliances with wealthy and powerful men, black and white--all in an effort to solidify and expand their freedom. Never fully free, black women had to depend on their skills of negotiation in a society dedicated to upholding both slavery and patriarchy. Forging Freedom examines the many ways in which Charleston's black women crafted a freedom of their own design instead of accepting the limited existence imagined for them by white Southerners. Myers, Amrita Chakrabarti. 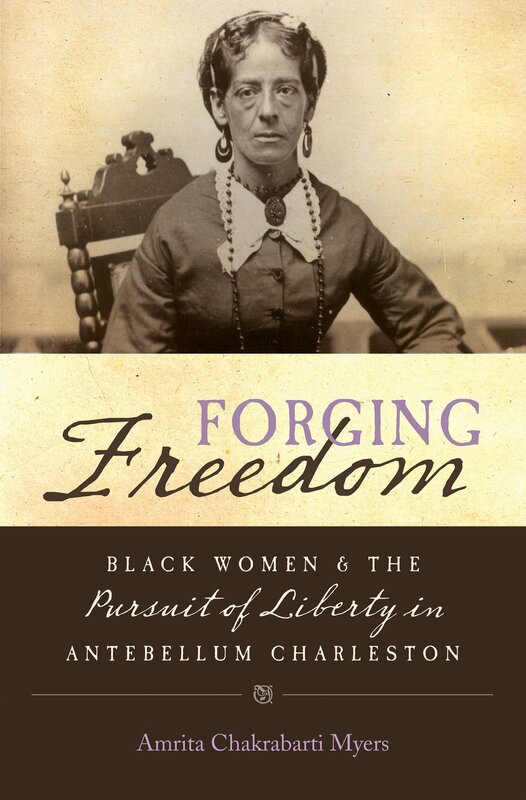 Forging Freedom: Black Women and the Pursuit of Liberty in Antebellum Charleston. The University of North Carolina Press, August 2014.